You're receiving this newsletter because you visited the Tiare Films stand at the Wellington Wedding Show, or you signed-up at the Tiare Films website. Having trouble viewing this email? View it in your browser. Welcome to the winter (and first) edition of our newsletter. In this issue we recap the 2009 Wellington Wedding Show. 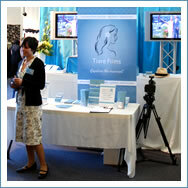 This year was first time we've had a stand at the Wellington Wedding Show. We'd like to thank all of the brides, couples, parents and bridesmaids who chatted with us. The 2009/2010 wedding season looks set to be an exciting one. Yes. In addition to great visuals, we’ve fitted our cameras with microphones specially designed for recording readings, toasts, and musical numbers. We're now taking bookings for the 2009/2010 season. It's best to confirm your booking with us at least 6-9 months in advance of your wedding. Popular dates are 5 Dec, 20 Jan, 13 Feb, and 6 Mar (each with 7 weddings), with January overall the busiest month for weddings in the capital. The edited highlight films we screened at the wedding show are now available on our website. We also upload the film to the web for you to share with family and friends - great for those who can’t attend the wedding (or who want to see their cameo). Wellington is definitely New Zealand's most cosmopolitan center - we talked to couples planning to marry in Queenstown, Taupo, New Plymouth, Melbourne, and Vanuatu. Nearly three hundred couples entered our draw for the chance to win bride and groom coverage (valued at $400) free with their wedding DVD package. We've decided to give those couldn’t make the show the chance to enter too. So if you have engaged friends or family, let them know that they can now register online (entries close 30 May). We draw the winner 31 May. Good luck! There was plenty on display at the show to inspire wedding planners. If you need to track down the details of an exhibitor, The Wellington Wedding Show website provides a handy list of exhibitors, including links to their websites. As part of our wedding show promotion we’re offering a 10% discount on our Pearl package when you book before 30 June. To arrange your free wedding DVD consultation or make a booking, please contact Justine Flanagan, +64 4 3800 800 / justine@tiarefilms.com.